Probabilistic methods are increasingly becoming an important tool in a variety of disciplines including computer science, mathematics, artificial intelligence, epistemology, game and decision theory and linguistics. In addition to the discussion on applications of probabilistic methods there is an important philosophical debate concerning the precise meaning and interpretation of probabilistic and statistical statements. 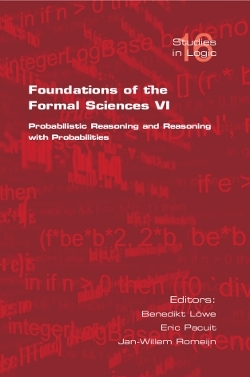 This volume contains fully refereed versions of papers presented at the sixth installment of the conference series Foundations of the Formal Sciences (FotFS) which was an interdisciplinary venue bringing together researchers using probabilistic and statistical methods in their respective fields and researchers who are concerned with the philosophical interpretation of probability and statistics to exchange ideas, approaches and techniques. The conference FotFS VI facilitated discussions about the applicability of probabilistic methods and helped to ground foundational debates with concerns for practitioners of probabilistic methods.